Allison is a certified Speech-Language Pathologist who earned a Bachelor’s Degree in Communication Sciences and Disorders at Florida State University and a master’s at Alabama A&M University. While attending the Florida State University, Allison obtained a certificate in Developmental disabilities and worked with one of her professors for autism research. This experience allowed her to gain insight on working with children and families affected by autism. 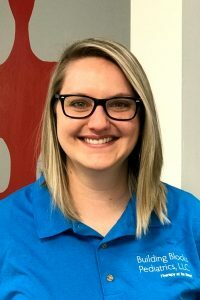 Allison has also attended numerous continuing education courses on pediatric feeding and enjoys working with children to aid in bottle feeding all the way to trying new foods. Allison is also trained in the S.O.S. feeding program. Allison has experience working with children, newborns-21 years old, in the following areas: Articulation and Phonology, Fluency (Stuttering), Early Childhood Language Delays, Expressive and Receptive Language Delays and Disorders, Autism, Feeding, Pragmatic Language (Social Skills) and Down Syndrome. When she is not working, Allison enjoys spending time outside in the water or hiking with her pup.